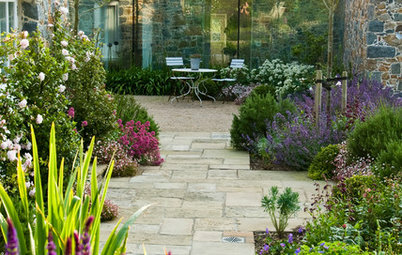 “I knew they would make good decisions,” architect Julie-Ann Clements says about the owners of this Victorian terrace in Devon. The job was smaller than her usual projects, but Julie-Ann was happy to take it on. “They’re really nice people, and I sensed they had good style,” she says. 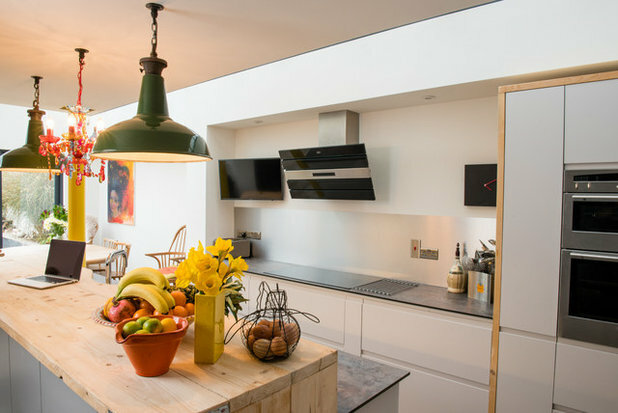 To help them stay on budget, In Ex Design provided the design, plans and specifications, while the owners managed the builder on site. 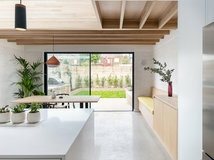 The owners’ brief to In Ex Design was to help turn the rear of their property into an open-plan kitchen-diner with a connection to the garden. 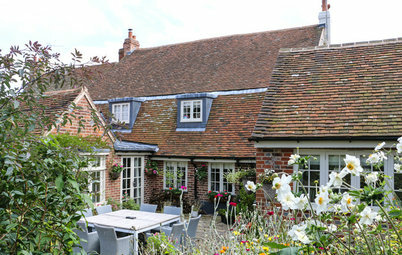 The original extension had two separate areas – a kitchen beneath the sloped roof and a separate glass infill extension (to the left). 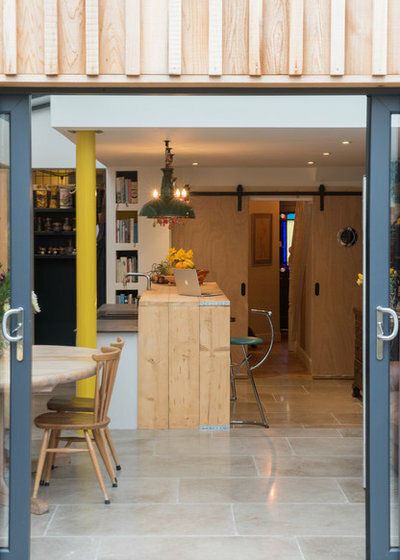 “We put together a design that gave them a more open-plan dining area and utilised the side passageway,” Julie-Ann says. 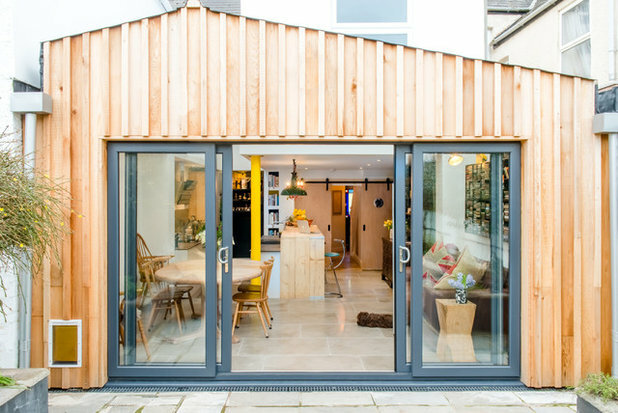 The new, pitched-roof extension is made of timber. “We used larch, as it’s a more cost-effective alternative to oak, and ages in a similar way,” Julie-Ann says. 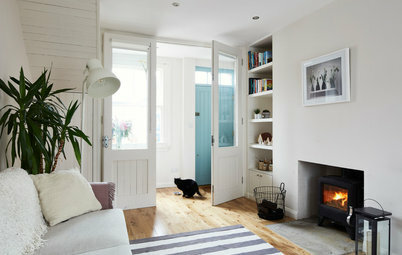 They also saved money by choosing sliding doors rather than more expensive bifold ones. 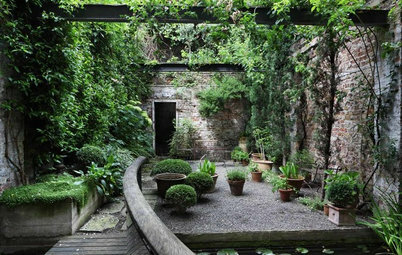 The patio was repaved in Indian stone (done after this photo was taken) to tie in with the limestone floor tiles inside. Find an architect or building designer in your area. 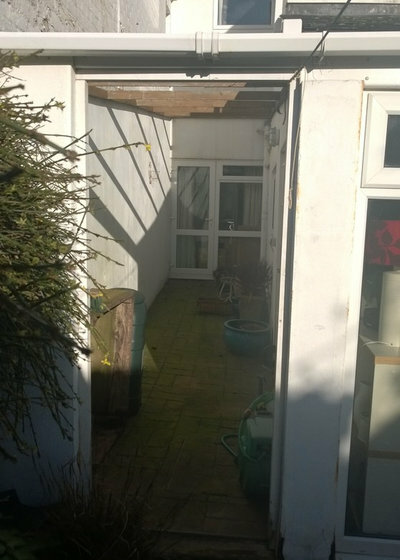 To make better use of the infill extension, Julie-Ann instructed the removal of the external wall that separated the two areas. 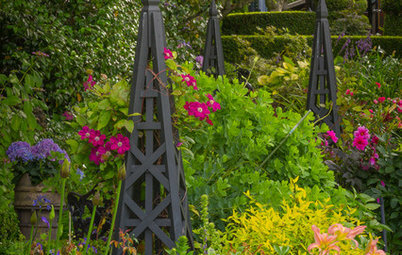 It would have been extremely difficult and costly to fit steel supports in this space, so a column was installed instead. 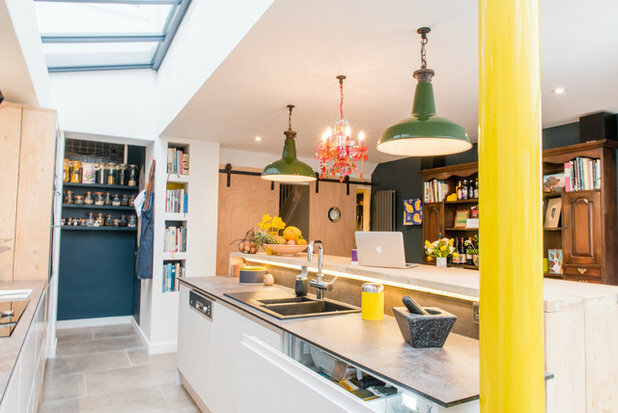 “The owners love yellow, so they made a feature of the column with this bright colour,” Julie-Ann says. 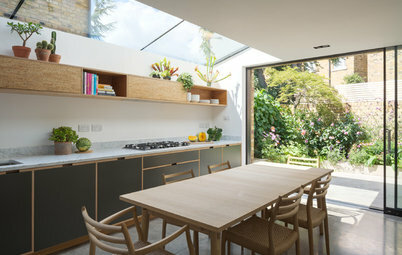 The flat roof at the side was replaced with a long skylight to bring plenty of daylight into the space. The previous dining area was in the extension. 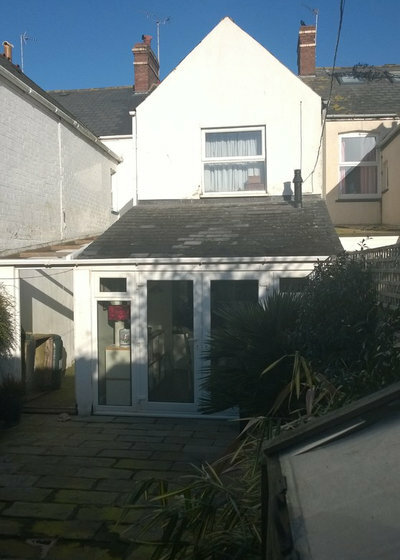 This was knocked down and replaced with the pitched roof construction with a glass ceiling. The cupboard to the left of the washing machine seen here is where the column is now. The husband is a qualified chef, and spends a lot of time in the kitchen. 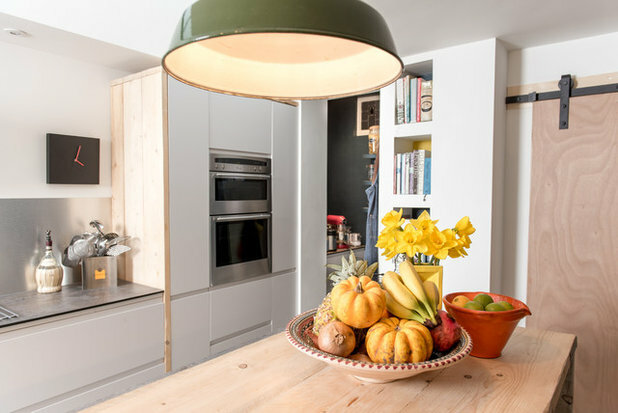 “It was very important for him to have a good extractor fan, so he went for this one,” Julie-Ann says. 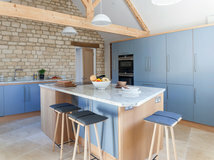 The breakfast bar is higher than the worktop, so for anyone grabbing a bite there, the sink area is mostly hidden. The oven housing area is also clad with scaffold boards, which gives a cohesive look to the space. 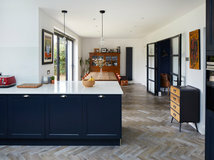 The solid laminate worktop resembles concrete. 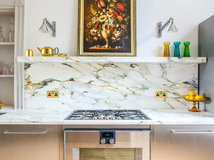 “The slim design maintains the neat lines in the kitchen,” Julie-Ann says. A brushed-steel splashback protects the wall. 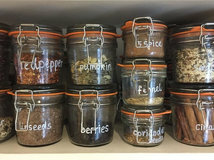 Below are wide drawers, while cupboards frame the ovens. 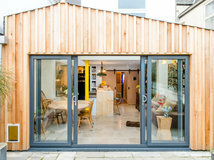 Discover timber cladding ideas for your extension. 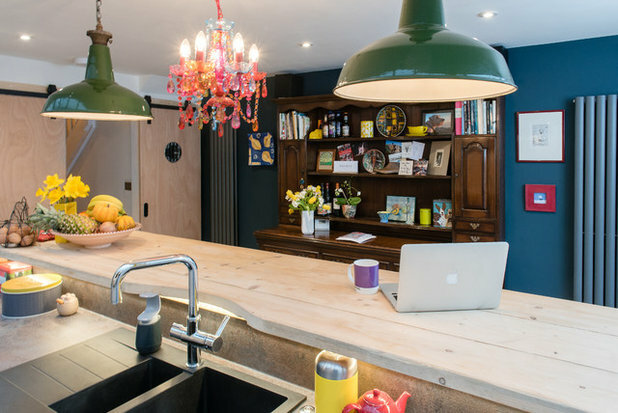 The island contains bin storage, a dishwasher and a drawer fridge plus a resin sink. LED strip lights in the back of the breakfast bar illuminate the prep area. 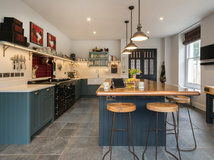 Lighting in the rest of the space consists of salvaged pendants, industrial wall lights in the dining area, spotlights in the flat ceiling, and task lighting above the worktop. A vintage dresser provides a warm contrast to the industrial-style kitchen. 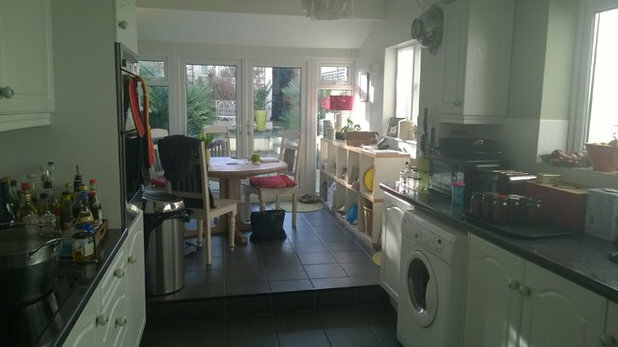 There was an extra reception room to the rear of the kitchen that was previously used as a dining space. 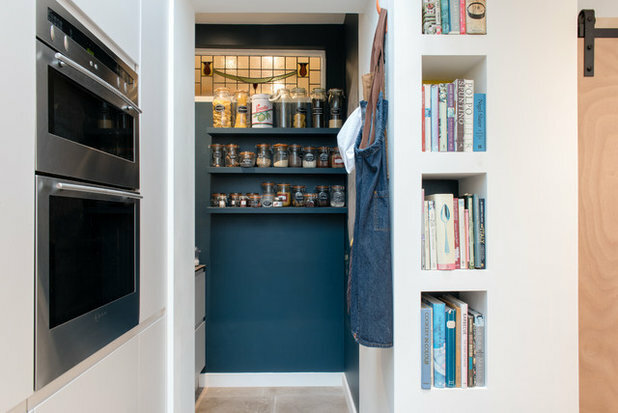 The designers transformed this unused area into a larder zone, utility room and cloakroom. 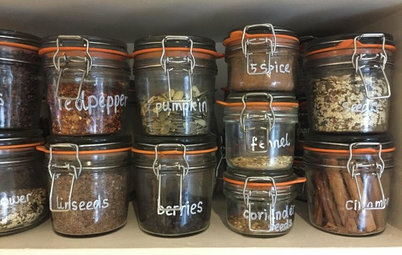 To the left of the pantry shelves is an area for making tea and coffee. 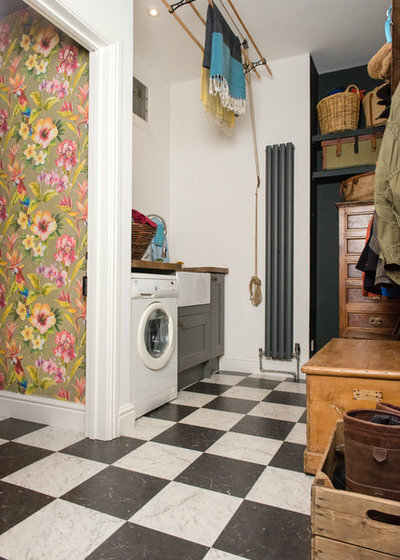 Behind this is the utility zone, equipped with a washing machine, sink and practical vinyl flooring. What do you like about this open-plan space? Share your thoughts in the Comments section. 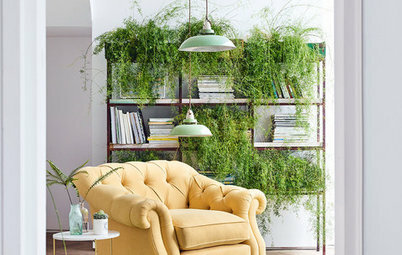 This is a very good looking, practical job and must feel as though the space is twice as big. 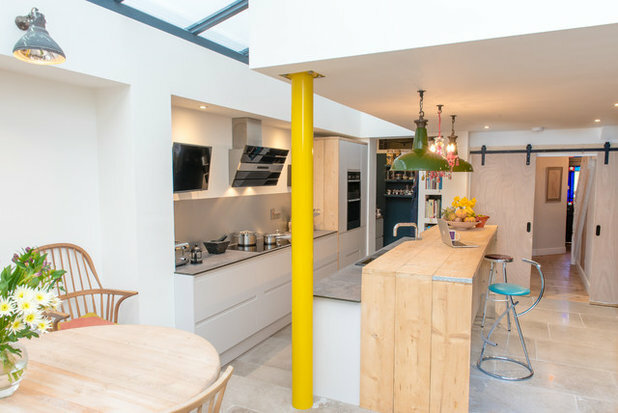 I particularly like the use of scaffold boards, they are a great resource both new and recycled, the wood has to be structural quality and correctly seasoned so that it won't warp in any weather conditions. I'm curious as to the finish used, I have used both epoxy and multiple coats of marine varnish, the varnish being much easier to redo later. I usually get three to five years on a kitchen table with varnish. I love the use of so much wood here, annnd the sliding barn doors, annnd that wonderful, proper wooden 'slat and pulley' clothes airer. Brilliant! 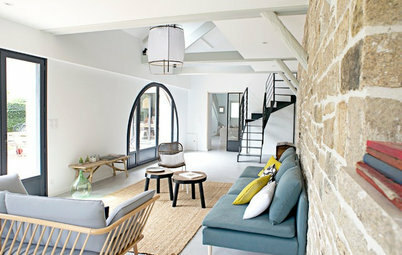 Wow what a great project...such an improvement and such a lovely light and bright space! 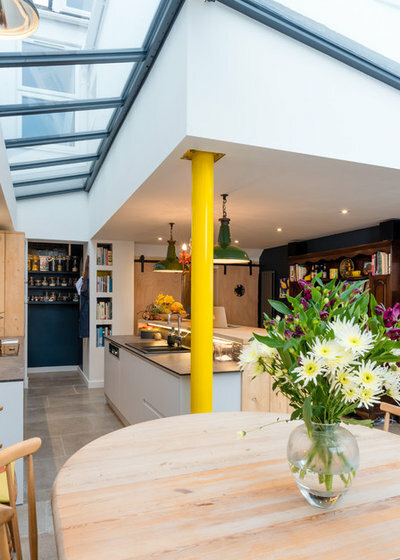 Love all the quirky elements to the design, the flash of floral print wallpaper, the yellow column and the fab over island pendant lights.